Call on the Deputy Prime Minister of Malaysia, Tan Sri Dato' Haji Muhyiddin Bin Mohd Yassin by Shri Kamal Nath, Minister of Road Transport and Highways of India on 21 December 2010. Shri Kamal Nath, Minister of Road Transport and Highways of India and Dato' Shaziman bin Abu Mansor, Minister of Works, Government of Malaysia during the signing ceremony of MoU on Co-operation relating to the provision of technical assistance services on highway management and development in India; Prime Minister of Malaysia, Dato' Sri Najib witnessing the event. Audience with 'Yang di-Pertuan Agong Tuanku Sultan Mizan Zainal Abidin and Raja Permaisuri Agong Tuanku Nur Zahirah' at Royal Palace. 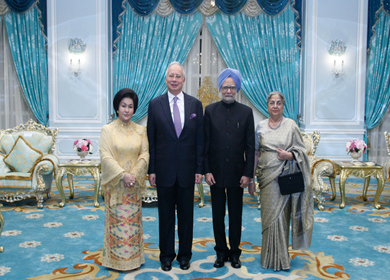 The Prime Minister, Dr. Manmohan Singh with the President of the Malaysian Indian Congress, Dato Seri S Samy Vellu, and other senior functionaries of the Malaysian Indian Congress (MIC) in Kuala Lumpur, Malaysia on October 28, 2010. 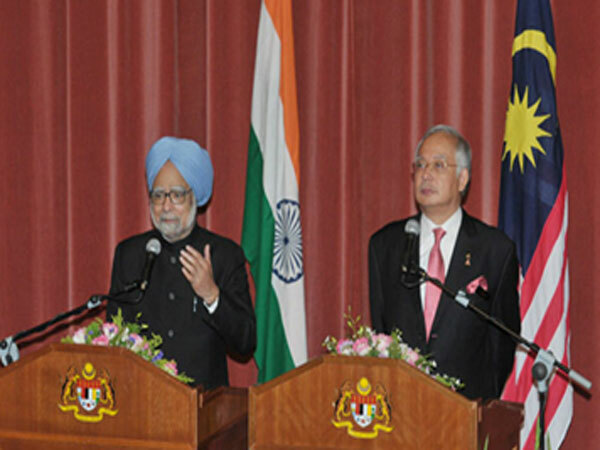 Media Statement by the Prime Minister Manmohan Singh after Official Talks on October 27, 2010. The Prime Minister Dr. Manmohan Singh, during the Inauguration of LITTLE INDIA at Brickfields in Kuala Lumpur, Malaysia on October 27, 2010. (from left) Dato' Senator Maglin Dennis D'Cruz, Deputy Minister of Information, Communication and Culture of Malaysia, Photographer Benoy K. Behl and High Commissioner of India to Malaysia, H.E. 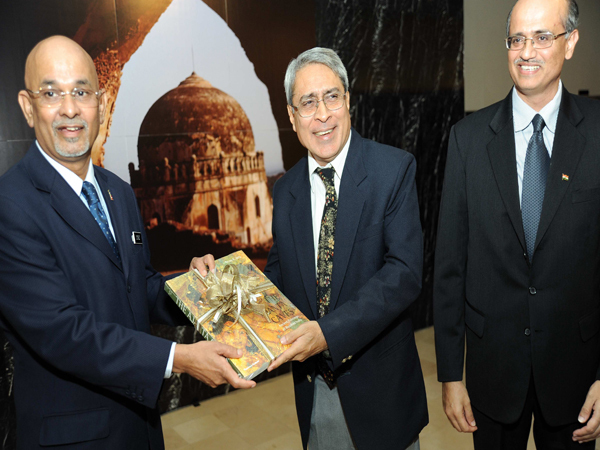 Vijay K. Gokhale at the launch of the exhibition entitled 'Islamic Monuments of India' at the Islamic Arts Museum Malaysia on 1st October 2010. (from left) Deputy Chairman of Planning Commission of India, Dr. Montek Singh Ahluwalia, Malaysian Deputy Prime Minister Tan Sri Muhyiddin Yassin and Securities Commission Chairman Tan Sri Zarinah Anwar at the Inaugural Session of the Second World Symposium on 27th September 2010 at which Dr. Montek Singh Ahluwalia was a keynote speaker. 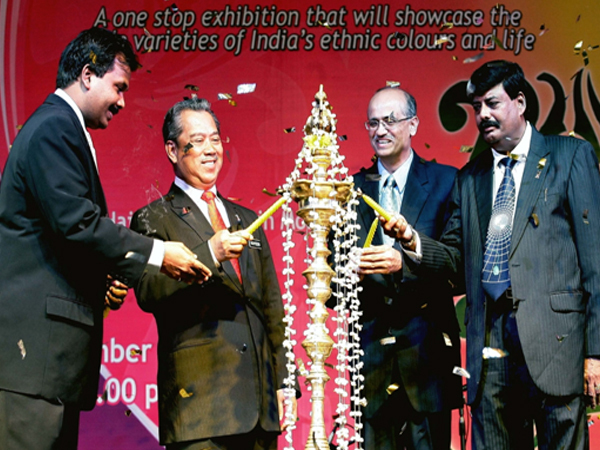 Deputy Prime Minister Tan Sri Muhyiddin Yassin (second from left), Indian High Commissioner to Malaysia Vijay K. Gokhale (second from right), Malaysia-India Chamber of Commerce president Kanaraja Raman (right) and Global Indian Festival organising chairman Jaggarao Simancha lighting a kuthuvillaku at the launch of the Global Indian Festival. 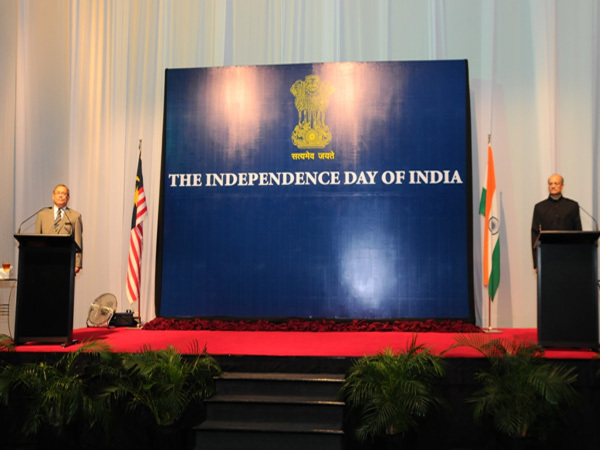 Deputy Foreign Minister, YB Dato' Richard Riot Jaem and High Commissioner of India, Mr. Vijay K. Gokhale at the Independence Day Reception at KLCC. H.E. Mr. Anand Sharma, Minister of Commerce and Industry of India paid a Courtesy Call on Hon'ble Prime Minister of Malaysia Dato' Sri Mohd Najib bin Tun Razak on 7 July 2010. Three Indian Navy Ships visited Port Klang, Malaysia on a goodwill visit from 20 to 23 June 2010 Rear Admiral P. Murugesan, VSM, Flag Officer Commanding Eastern Fleet paid a courtesy call on Vice Admiral Datuk Mohd Noordin bin Ali, Deputy Chief of Royal Malaysian Navy on 21 June 2010. Fun Run Relay at Dataran Merdeka Hundreds of people participating at the Fun Run at Dataran Merdeka in Kuala Lumpur on Sunday, 13th June in the morning. 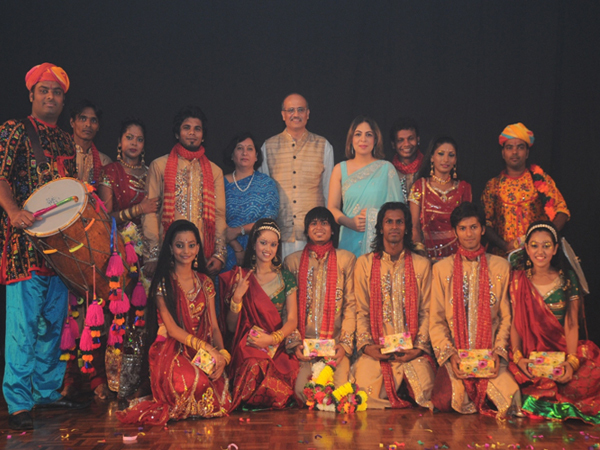 An Extravaganza of Bollywood Dance & Music "Bollywood Through The Ages", a production by Shubhra Bhardwaj & Troupe from India, was held at the MAS auditorium on Sunday, 13 June 2010. Ceremonial Welcome of the Queen's Baton in Malacca, 12 June 2010 (Third from left) Chief Minister of Malacca, Datuk Seri Hj Mohd Ali bin Rustam, High Commissioner of India, H. E. Mr. Vijay Gokhale and Mr. T. S. Darbari, Joint Director General, Commonwealth Games 2010 Organizing Committee with the Queen's baton on Saturday, 12th June, 2010 in Malacca. Tree Planting at the headquarters of Olympic Council of Malaysia. A Mukudu tree was planted by Prof. Dato' Ar. W. Y. Chin, Vice President of Olympic Council of Malaysia and Ms. Pooja Kapur, Counsellor (Press, Information, Culture & Community Affairs), High Commission of India in Kulala Lumpur, as part of a simultaneous Tree Planting Ceremony in Delhi, London and Kuala Lumpur on 12th June 2010 to mark the New Delhi Commonwealth Games as the first Green Games. 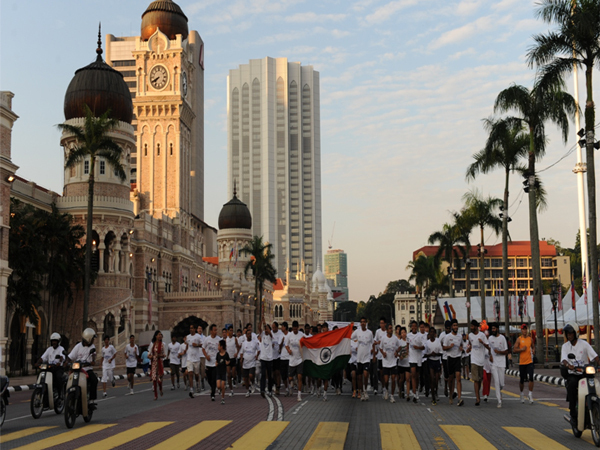 The Business Conference coinciding with the arrival of the Queen's Baton in Malaysia for the XIX Commonwealth Games to be held in New Delhi in October 2010. 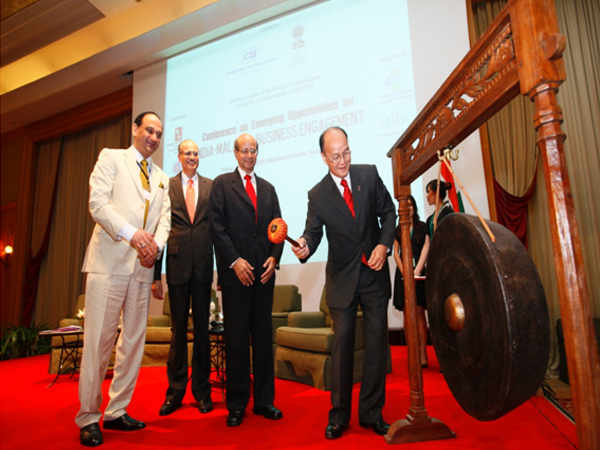 Deputy MITI Minister Datuk Jacob Dungau Sagan officiating the business conference on Emerging Opportunities for India - Malaysia Business Engagement by hitting the gong on Friday, 11th June, 2010 at Mandarin Oriental Hotel, Kuala Lumpur. Also present were (from left) Mr. T. S. Darbari, Joint Director General, Commonwealth Games 2010 Organizing Committee H. E. Mr. Vijay Gokhale, High Commissioner of India, and Mr. A. P. Mull, Leader of the Confederation of Indian Industry Delegation. H.E. Mr. Vijay Gokhale presenting the Letter of Credential on 25 March 2010 to the Yang di-Pertuan Agong Al-Wathiqu Billah Tuanku Mizan Zainal Abidin Ibni Al-Marhum Sultan Mahmud Al-Muktafi Billah Shah, King of Malaysia. H.E. Dato' Seri Mohd Najib, Prime Minister of Malaysia receiving H.E. 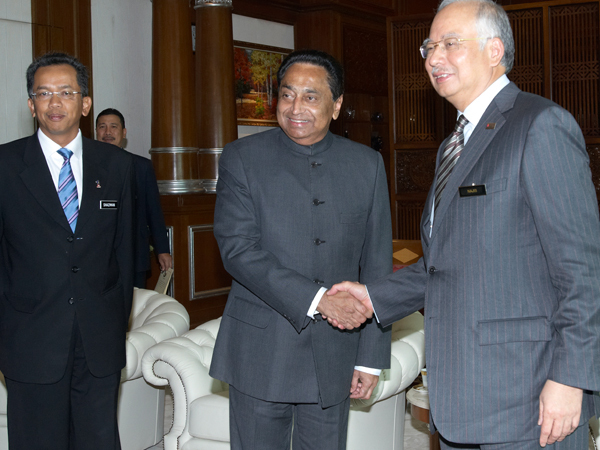 Mr. Kamal Nath, Minister for Road Transport and Highways (left) during latter's official visit to Malaysia from 4 to 5 January 2010. Also seen in the picture is Malaysian Minister for Works H.E. Datuk Shaziman bin Abu Mansor. 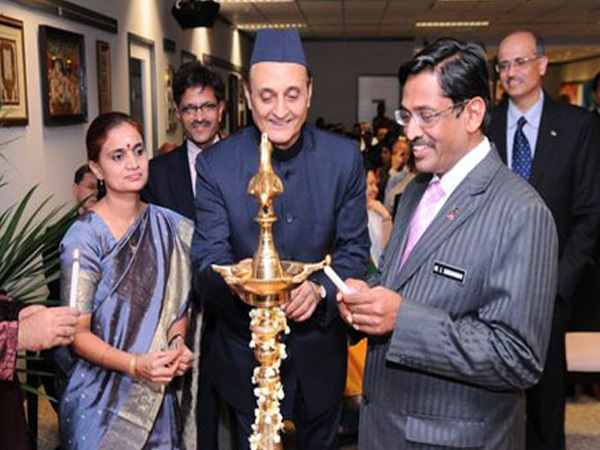 The new Indian Cultural Centre (ICC) was opened at CapSquare in the heart of Kuala Lumpur, by Datuk Dr. Subramanyam, Minister of Human Resources of Government of Malaysia and Dr. Karan Singh, President, Indian Council for Cultural Relations (ICCR), New Delhi on 10 February 2010. Hon'ble Prime Minister H.E. 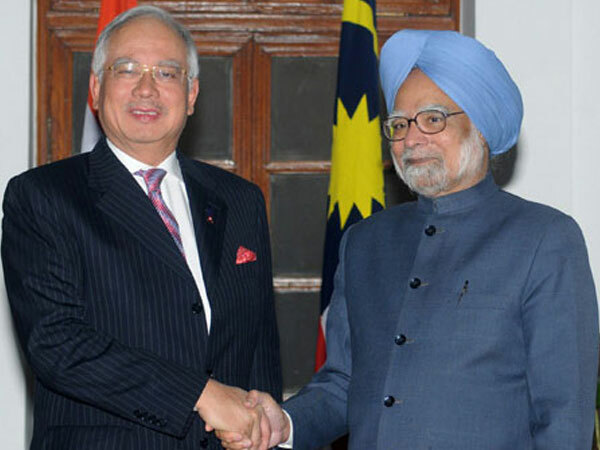 Dr. Manmohan Singh receiving Hon'ble Prime Minister of Malaysia H.E.Dato' Sri Mohd Najib Tun Abdul Razak in New Delhi during latter's visit to India from 19 to 23 January 2010.